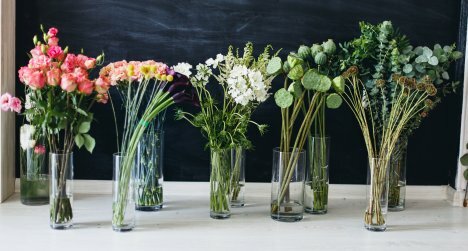 Calculating and Designing Wedding Flowers - How Much Do I Order? Ok . . you've picked out your flower designs, added up the stems of flowers and calculated how many stems you need. Don't forget the extras, like a floral knife, Finishing Touch flower sealant, Crystal Flower food, and other hard goods like bouquet holders and florist foam for the centerpieces. Now it's time to get busy and set up your design space. You'll need for it to be a cool room (like a garage, basement or air conditioned room) and hopefully have an extra refrigerator for the cut flower designs like corsages and boutonnieres. Set up tables and (if necessary) spread a tarp under the design area. Designing flowers is a messy business, so be sure to have a box of heavy duty contractor garbage bags and a couple of large trash cans. You'll need at least one (five gallon) bucket for every 3 bunches of flowers you have ordered. You can pick up some shorter or smaller buckets (one gallon) for smaller stemmed flowers (such as freesia). Browse a local thrift store or Salvation Army and pick up some assorted cheap vases. These will come in handy later for delivering your flowers to your church or ceremony venue. DON'T THROW AWAY THOSE FLOWER BOXES! The flowers arrive in heavy, long cardboard boxes. You'll find several ice bags inside (that are now probably liquid). Throw these back into the freezer and pick a few more up at the dollar store. You'll place the newly frozen ones into your own delivery boxes to help keep those flowers cool when you have to deliver the flowers on the wedding day. Fill your water buckets and some of your vases ahead of time. Trust me - every job you already have finished when the flowers arrive will make processing them go so much faster! Turn the air conditioning really down cold (if you have to - put on a sweater!) The flowers open more slowly in cooler temps and you want to extend the life all you can. Don't worry - most flowers have a five to 7 day vase life in regular temperatures. If you have one - run a cool mist humidifier. Professional florist coolers deliberately put moisture INTO the air. Regular home air conditioners and refrigerators take moisture out of the air, so you'll need Finishing Touch to seal the flower petals and a cool mist humidifier will help keep the moisture in as well. If buckets are grimy or dirty, wash with small amount of soapy dish soap. Rinse all soap out of bucket. Now pour water your buckets with that has been treated with 1 capful of bleach. (I use a toilet brush from the dollar store) After swirling the clean buckets with the bleach water - DON'T RINSE. The bleach residue will help cut down on the bacteria that grows in the water. Dumping out dirty water and refilling with clean new water helps as well. Clean off every stem, stripping the leaves that are on the stems that will go below the water line. Leaves break down quickly and cause bacteria to grow. Clean water extends life of flowers so much!! Make sure every . . . single . . . cut. . . end GOES UNDER THE WATER LINE. Limp flowers the next day are usually because their stem doesn't go all the way under the water. No water source = dead flowers. "Nuff said. Please read all the directions for processing the flowers correctly. Cutting the stems underwater, using a re-hydrator like Quick Dip and flower food in the water all goes a long way to making your beautiful flowers last longer. Have your tables set up with all your tools within reach. Line your flowers up in clean vases (rinsed in bleach water) and ready to have flowers popped into them. Don't crowd them so tight you can't pull out a rose without pulling out the whole bunch. These flowers have to be easily reached and taken out with one hand, as your other hand may be busy holding the hand tied design. Keep your tools (sharp knife, Finishing Touch, branch pruners, waxed string, ribbon, florist tape) handy where you can reach them - but not where they get lost on the table. Organization is everything! Line up extra helpers who can hand you the stuff you need or help you tie off a bouquet or get you a clean pitcher of water. Last of all - post your flower order sheet where you can read it for easy reference. That way you know how many flowers to put into each design. This, in turn, will help keep you on track so you don't fall short of flowers when you get to your last bridesmaid bouquet and find out you don't have any pink roses left! Last of all . . . enjoy the process. I love working with flowers and find true joy in it. The tutorials on this site are pretty detailed and help walk you through the process. I've done many flowers out of my home with just a regular refrigerator and have lovely flowers on the wedding day. Don't be too ambitious and try to do a huge wedding party and forty centerpieces (at least not without a team of helpers!) You can save a great deal of money on the bouquets. These are actually cheaper and easier than corsages and boutonnieres, which generally have to be done last. Source those out to a florist if you run out of time and need help. 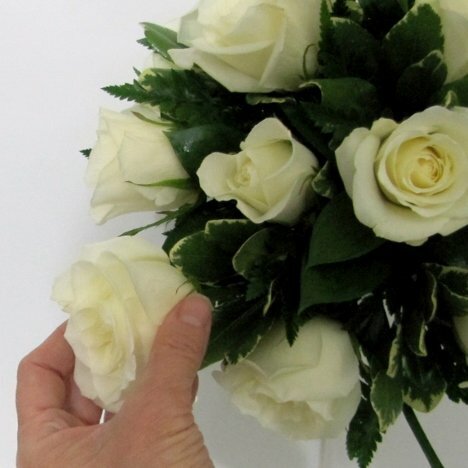 Line up your attendant bouquets and do them assembly line style. This keeps them all looking the same both in flower insertion and size of the finished bouquet. 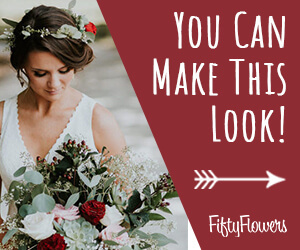 Having four different people do four different bouquets is one way to guarantee they won't all look the same! Last . . . read through as many of the tutorials as you can, bookmarking specific pages. I share a lot of tips and tricks for working with different flowers, wiring methods and secret tricks for getting bent flower heads to face in the right direction. Be sure to send me a photo of your designs! I love to see what my customers have created with the beautiful flowers we ship out of our warehouse.